Below is a collection of the answers to the most common questions people ask about our audiology services. An Audiologist is a healthcare professional specializing in evaluating, diagnosing, monitoring and managing disorders of the auditory and vestibular systems in adults and children. An Audiologist uses a variety of tests and procedures to assess hearing and balance function, and to provide rehabilitative services, such as dispensing hearing aids and other assistive listening devices. Hearing loss is a full or partial decrease in the ability to detect or understand sounds. It could be sudden or gradual. Between the two extremes of excellent hearing and deafness, there are many degrees of impairment. The terms used to describe the degree of hearing loss are mild, moderate, severe and profound. 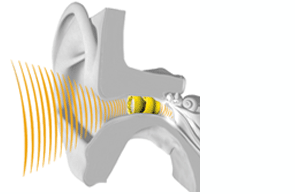 Hearing loss can be categorized by where or what part of the auditory system is damaged. There are three basic types of hearing loss: conductive hearing loss, sensori-neural hearing loss and mixed hearing loss. Hearing loss is the world’s single most common disability. Hearing loss negatively influences communication and may have an effect on personal, social and vocational function. Correcting it can result in a significant improvement in quality of life. Hearing loss can be the result of damage to any one of these sections. Typical problems with the outer ear (A) include ear wax plugs and infections of the auditory canal (otitis externa). Usually, addressing these problems is very easy. But it is important to act quickly in order to avoid hearing damage. Inflammation, fluid behind the eardrum, perforations of the eardrum and otosclerosis (a stiffening of the bones in the middle ear) are the most common problems to interfere with middle ear (B) function. Most outer and middle ear problems can be addressed effectively with medication or surgery. If this is not possible, permanent hearing loss can be compensated with a hearing aid in most cases. The majority of hearing issues concern the inner ear (C). The most common cause is the natural aging process (presbyacusis). But loud noise, taking some types of medication, as genetic predisposition to hearing loss or skull fractures can also have a negative influence on a person’s hearing ability. These influences damage the fine hair cells and affect the transmission of signals to the auditory nerves. Usually, inner ear hearing loss cannot be addressed medically. However, this type of hearing loss can be corrected with a hearing aid in most cases. Hearing loss caused by an outer or middle ear defect is called conductive hearing loss. Damage to the inner ear, is called sensorineural hearing loss. If both types occur together, the condition is called mixed hearing loss. An audiogram is a graphic representation of the results obtained during a standard hearing test. During the hearing test, various tones are presented to each ear and a mark placed on the audiogram at the point where the sound is just audible (the threshold). A separate set of symbols is used for the left and right ear results. The vertical lines represent various frequencies from very low pitches (250 cycles per second or Hz) on the left to high pitches on the right (8,000 Hz). The horizontal lines represent various degrees of loudness in decibels (dB) from very soft sounds at or near 0 dB, to very loud sounds at or near 110 dB. Do you have trouble hearing in a noisy background e.g. restaurants or pubs? Do you misunderstand what others are saying (especially women / children) and respond inappropriately? If you have answered yes to any of these questions, you should have your hearing tested by an Audiologist. If your child has one or more of the following symptoms, he / she may have difficulty hearing. Failure to startle or wake to loud sounds. Delayed and/or inappropriate speech recognition. Frequent ear infections (earaches or runny ears). People have to raise their voice consistently to get the child’s attention. The child responds inconsistently to sound. At any age the child watches the speaker’s face carefully. The child turns his head so that one ear is facing the direction of the sound source. The child talks in a soft or loud voice. The child turns the radio or television up. The child does not always come or look when called. The child confuses sounds that are alike. The child’s speech is poorer than you would expect of a child of his or her age. The child frequently asks for things to be repeated. The child often answers a question with an unrelated answer. The child seems inattentive at home or at school. What payment or reimbursement options do I have? Patients with Vhi, BUPA or Aviva health insurance can claim back up to €40 for their hearing assessment. Tax relief can be claimed for medical expenses for the highest rate of tax you pay. This includes hearing assessments and hearing aids. For more information go to www.revenue.ie. A grant is available, under the Treatment Benefit Scheme, for those who have made PRSI contributions for 5 or more years. You may also qualify for the grant through your spouse’s contributions. If you qualify, you are entitled to up to €1520 towards the cost of your hearing aids. More information can be obtained at the Treatment Benefit Scheme section of the Department of Health and Children website: www.dohc.ie.